Walk with your child through standardized questions that assess their abilities, including language, movement, thinking, behavior and emotions! 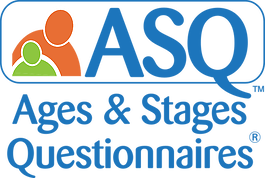 The Ages & Stages Questionnaire®, Third Edition (ASQ-3™) is absolutely FREE and pinpoints developmental progress in children between the ages of one month and 5 ½ years. The American Academy of Pediatrics recommends every child be screened at 9, 18 and 24-30 months or whenever a caregiver has a concern. Going through the process of a developmental screening can be both fun and educational! Many tools use activities children already engage in or view as games to assess milestones. The screening can provide ideas for new activities to try with your child as well as help you to understand the types of skills your child may be developing at each new stage. Take The ASQ-3 Now for Free! If you would like to receive a paper copy of the ASQ-3 by mail, contact one of our care coordinators. Looking for more resources on developmental screening? The Center for Disease Control and Prevention (CDC) has information about developmental monitoring, screening and evaluation as well as many tools to support parents in doing developmental monitoring at home. Simply visit CDC Developmental Monitoring and Screening.